Fetal size: weight almost 5 pounds (2.28kg) by this week. Crown-to-rump length about 12.8 inches (32cm). Total length approximately 19.8 inches (44cm). Mother's size: From top of uterus to bellybutton, approximately 5.6 inches (14 cm). From the pubic symphysis (pubic bone) to the top of the uterus, approximately 13.6 inches or 34cm. Gums now have ridges which may look like teeth. Head may now position (head-down) into pelvis getting ready for delivery. 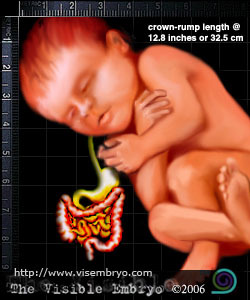 Gastrointestinal system is very immature and will not mature until three or fourth years after birth. Baby stores about 15% of weight in fat to keep temperature of body warm. Baby still receives and eliminates nutrition through umbilical cord. Limbs begin to dimple at elbows and knees and creases form around wrists and neck. Skin appears light pink because of blood vessels close to its surface.